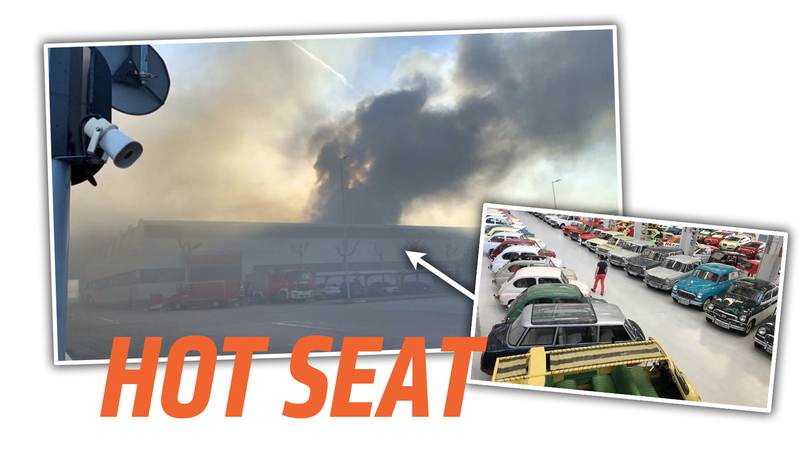 A fire broke out in a warehouse next to the historical collection of Seat, the Spain-based branch of the Volkswagen Group, containing about 200 cars at SEAT’s headquarters in the Zona Franca area of Barcelona. Luckily, I’ve been in touch with Isidre Lopez Badenas, the curator of Seat’s historic collection, and he has assured me that while there’s been some structural damage, all the cars, archives, and people are safe. This is a relief, as I’ve been to this fairly obscure and underrated collection, and it’s fantastic. You can see some SEAT 600s already safely out of the building, and in that clip you can also see the SEAT Panda-based Popemobile being pushed to safety, which was built for Pope John Paul II’s visit to Spain in 1982. Incredibly, this Popemobile was converted from a normal Panda in a mere two weeks! I’m also pretty sure it’s the smallest Popemobile ever built. Spain’s Motorpasion reports the fire appears to have started in the press maintenance workshop of the factory, and it’s reported that 13 firefighters were required to put out the blaze. As I mentioned before, all the people, archives, and cars are fine, and while the building itself will require repair, it looks like one of Spain’s most interesting car collections will live on. A Little Tribute To The "Black Mouth"